India launched its first-ever information war against Russia last week, signaling that the decades-long friendship between the two Great Powers is quickly becoming a factor of the past as New Delhi swiftly pivots towards Washington. 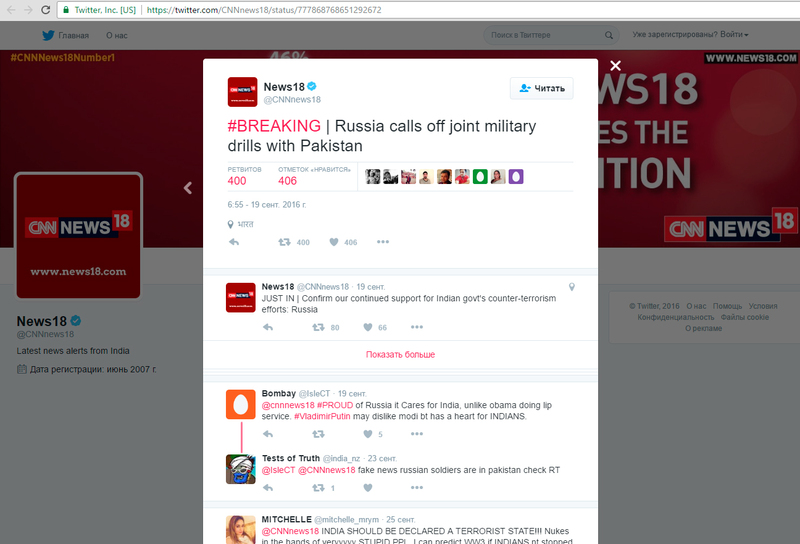 International observers were taken aback by the fake ‘news’ story that the Research and Analysis Wing (RAW, India’s version of the CIA) planted in India’s domestic media alleging that Russia had decided to call off its joint military drills with Pakistan as a sign of solidarity with India. The premise behind this infowar attack was to undermine the growing trust between the two Cold War rivals as they bravely put aside their historical differences and enter into a new era of multipolar win-win rapprochement. It was also conditioned to present Russia with an implicit ultimatum through which it would be faced with the false choice of ‘choosing’ between India and Pakistan, a totally fabricated dilemma which was designed purely for social media effect and in changing the subcontinent’s attitudes towards Russia. Unwittingly, however, this attack spectacularly backfired in the worst way for India imaginable, though it ultimately advanced the US’ strategic objectives. RAW anticipated that Indian media consumers would bite into this lie and that it would thenceforth be shared enough times by the hundreds of millions of Hindutva jingoists in the country as to generate a considerable social media impact and go viral, which is indeed what happened in the initial stages. Foreign media began picking up the false story without even checking the sources, which if they did, they’d see that the whole operation began with a single tweet by CNN-News18 (special thanks to Petri Krohn for finding the source). The false narrative that Russia had cancelled its drills with Pakistan was designed to pressure Russian decision makers into making this choice after the fact and in order to avoid ‘embarrassing’ their Indian ‘ally’, but the Indians totally misjudged the Russians because Moscow will never fall for such underhanded media tactics in influencing its policy. It’s not known exactly what he meant by this, nor what defining characteristics he feels best exemplify the ideology of ‘Indian Exceptionalism’, but evaluating India’s recent moves under the BJP-RSS government of Modi-Doval, it’s possible to make some educated inferences. The most applicable of these to the scope of the article’s research relate to the Russian-Pakistan mountainous military exercises, which India apparently feels are completely out of place despite the concurrent commencement of its own naval drills with Russia in the Far East that most neutral observers would reason should balance out any of New Delhi’s objections. India, however, wasn’t satisfied with this, despite the reassurances that Russia gave in response to New Delhi’s official pressure on Moscow. It’s fitting to mention that India is also holding provocative joint exercises with the US in the Himalayas right now and within close proximity to the Chinese border, though its leadership apparently doesn’t see any problem with this nor is able to understand how India’s military-strategic partnership with the US played a crucial role in Russia’s decision to hold counterterrorism exercises with Pakistan. Apparently, ‘strategic autonomy’ is only applicable to India and is opposed by New Delhi whenever Moscow practices it as part of its military diplomacy and wider balancing act in Asia, which thus makes this double standard the defining characteristic of ‘Indian Exceptionalism’. India’s foreign policy arrogance has long been an unmistakable quality guiding New Delhi’s relations with all of its South Asian regional neighbors, yet hitherto this point, it hadn’t been elevated to the level of India’s relations with Russia. The fact that New Delhi now feels confident enough with practicing this decades-long-established policy that it would incorporate it into its dealings with Moscow signifies a profound shift in India’s strategic thinking, and it’s credited in a large part to the Hindutva leadership of Modi-Doval. The ideological underpinnings of Hindutva are racial-religious supremacy and a predilection to genocidal violence, structurally mirroring its American Exceptionalist, Wahhabist, and Zionist ‘siblings’. If one understands the aforementioned three as forming a triple-headed ‘Cerberus’ of unipolarity, then it can conceptually be said that the hellhound has sprouted a fourth head with Hindutva, which has wasted no time in making its fellow ideologies proud by shamelessly turning against Russia and advancing unipolarity in the subcontinent through the same means that its counterparts do elsewhere throughout the rest of the world. In a clumsy attempt to follow the lead of the US in seeking to isolate Russia, India attempted something similar against Pakistan by relying on the same strategy of loud-mouth UN polemics and fierce information warfare, but just like Washington epically failed to isolate Moscow, so too has New Delhi abysmally failed to isolate Islamabad. Pakistan’s position on Kashmir was backed by the Organization of Islamic Cooperation, and even more significantly, Iranian President Rouhani agreed to work together with China and Pakistan on CPEC, which was a crushing blow for Modi and his powerful National Security Advisor Ajit Doval’s grand strategy of keeping Tehran confined to Indian-financed Chabahar and away from Gwadar. With such a multilateral backdrop of cooperation, Pakistan didn’t need the Russian military drills to show that it wasn’t isolated, but they certainly accentuated the point and powerfully showed India that it and its American-‘Israeli’ ally will never succeed in their Hybrid War on CPEC. RAW knew that there would be a sharp backlash from the Indian social media community if Putin didn’t obey Modi’s demand, and truth be told, they likely crafted this infowar campaign in such a way as to take full advantage of it when this predictably happened. 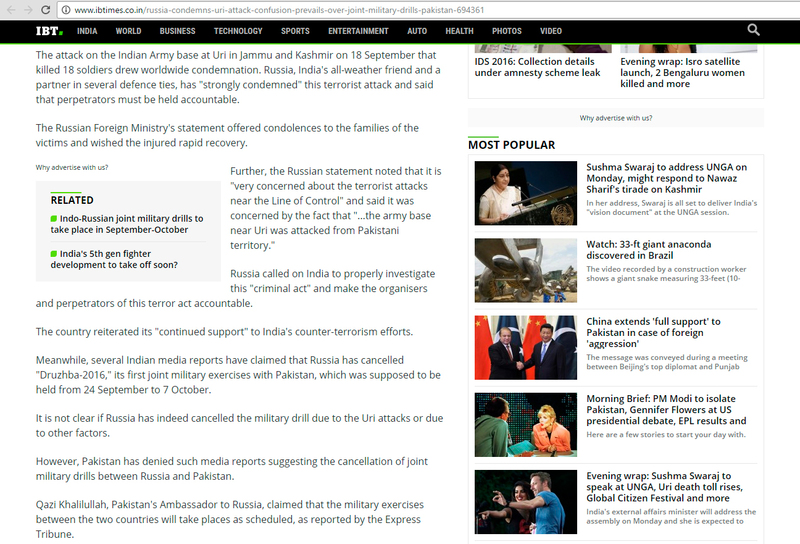 After getting hundreds of millions of Indians’ hopes up that their vaunted ‘Russian ally’ had taken New Delhi’s aside amidst India’s rising tensions with Pakistan, the entire social media community was then dismally disappointed when the truth emerged that this had not in fact happened and that Russian troops were proudly disembarking from their airplanes in Pakistan. The Indian troll factory, colloquially referred to as the ‘Modi Mob’ for their fanatical Hindutva allegiance to India’s ‘Dear/Supreme Leader’, came out in full force to lambast Russia on Facebook and other social media platforms, echoing their Home Minister’s statements that Pakistan is a ‘terrorist state’ and inferring that Russia is now one too for what it had done. Curious readers who haven’t yet experienced this hateful backlash firsthand are encouraged to read the comments on the “Russia & India Report” Facebook page, which has a handy collection of some of the ‘best’ that the ‘Modi Mob’ has to offer, including appeals that India switch its erstwhile strategic relationship with Russia for a new one with ‘Israel’ (which has already been in the works for years). From the American standpoint, everything is going according to plan, since RAW masterfully manipulated the Indian masses into a roller coaster of emotion during the week between the Uri Attack and the Russian-Pakistani military drills in order to perfectly position them to feel as much hate as possible towards Moscow. This was all done deliberately in order to cultivate ‘grassroots’ support among Modi-Doval’s Hindutva base for the anti-multipolar pivot towards the US, something which has already been ongoing for quite a while and was predicted by the author in two articles for The Duran back in May, the second of which directly spoke about the very real and pressing threat that India’s geopolitical reorientation has for breaking apart BRICS. Modi-Doval sacrificed India’s historical relationship with Russia in one fell move when they gave the authority for commencing the first-ever infowar against Moscow in using fake ‘news’ reports to pressure it into canceling the joint exercises with ‘terrorist-supporting’ Islamabad and then attempting to ‘shame’ it for not having done so. Forecasting ahead, it’s obvious that things will never be the same between Russia and India, as the latter’s media (the vast majority of which is indirectly controlled by the government or its Western allies to some extent or another) has noticeably taken a very negative editorial turn against Moscow. Granted, it’s nowhere near as blatantly obvious as the American media’s undisguised scorn towards Russia, but it’s significant because the unfriendly tone, language, and innuendo had never before been applied to Russia, and the fact that all of the national media have changed their attitude in unison suggests that they are doing so on New Delhi’s orders, whether Modi-Doval are acting ‘independently’ in this regard or receiving ‘advice’ from their military-strategic American partners in how to best hone their anti-multipolar message in the mass media. It can therefore be expected that the damage that Modi-Doval inflicted on India’s historic relations with Russia will become more publicly discussed in the coming future, as even the most sympathetic pro-Indian ‘experts’ (lobbyists, ‘agents’ of influence) in Russia belatedly come to realize that reality harshly contradicts their ‘wishful thinking’. On a final note, the upcoming BRICS Summit in Goa will be even more important than anyone could have previously imagined, since the radical geopolitical changes that the US has engendered in the course of just a single year will be on full display at the event. Brazil fell victim to a ‘constitutional coup’ and India is now a stalwart military-strategic partner of the US, while South Africa is still just as obscure as it has always been in the bloc. It took only one year for the US to dismantle the unprecedented achievement of the Ufa Declaration, and while all the BRICS states might still publicly commit to joint action in pursuit of their shared self-interest in reforming the global economic-financial system, the fact that India’s multipolar geopolitical backbone has been broken portends that the pivotal Eurasian foundation of this world-changing initiative is worryingly unstable. In terms of full-spectrum functionality, India’s geopolitical ‘defection’ to the unipolar camp signifies that the multipolar dream that billions of people had for BRICS is no longer driven by Yevgeny Primakov’s vision of RIC, but by Putin’s RC, though Iran might one day make a suitable replacement for India in reviving RIC under a modified format and linking together all of the Resistant & Defiant states.